Several municipalities, companies and womens’ groups said Saturday that they would back a strike planned Tuesday to protest domestic violence following the suspected murders of two teen girls last week. The city halls of Israel’s four largest cities — Jerusalem, Tel Aviv, Haifa and Rishon Lezion — all said they would allow workers to participate in the strike. Several Tel Aviv suburbs, including Ramat Gan, Bat Yam, Ramat Hasharon, Or Yehuda and Yehud also joined the strike, as did a number of Arab towns around the country. These included Tamra, Tira, Sakhnin, Taibe, Kafr Kassem, Jaljulia and Qalansawe. Thousands of women have indicated their intention to strike on Tuesday — on a Facebook page set up for that purpose — after two murders of teens this week brought the number of female victims since the beginning of the year to at least 23, the highest tally in years. According to organizers, among the companies allowing workers to strike are the Rami Levy and Tiv Ta’am grocery chains, the Fattal hotel chain, the Haaretz publishing group, and several high tech firms. The National Student Union and the Israel Teachers Union will also support the strike, though most schools will be off anyway Tuesday for the Hannukah holiday. In addition, several groups, including the Women’s International Zionist Organization, the Na’amat women’s movement, the Emunah social welfare organization and the Koach LaOvdim trade union will support the strike, among others, according to organizers. “If you’re a woman, you’re in. If you’re a man, join in,” a message on the Facebook page for the strike reads. 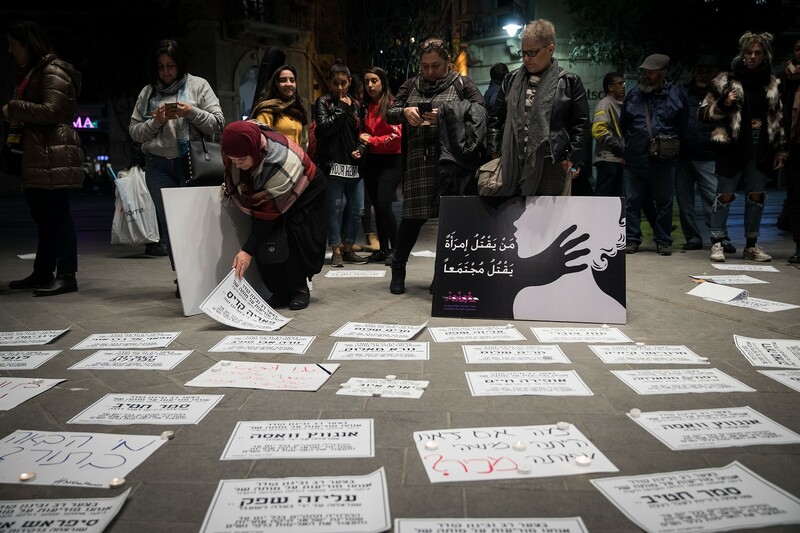 On Saturday dozens of women held a protest in the northern city of Nazareth to protest violence against women as well as general rising levels of crime within the Arab community, the Ynet news site reported. 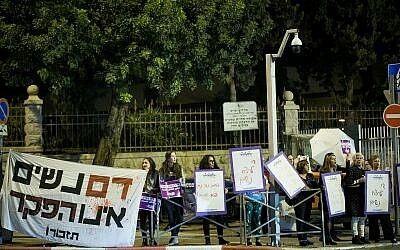 Protests took place last week in Tel Aviv, Haifa, Beersheba, and other locations following the pair of murders, which came to light days after the government shot down a bid for a parliamentary commission into violence against women, pushing a ministerial committee to investigate the matter instead. “When the government delays funds intended for women’s shelters and help centers, shoots down proposals for a special parliamentary committee to treat the issue, when police neglect complaints and closes cases without trial — they are contributing to the widening of the phenomenon,” activist Hadeel Azam of Nazareth said Saturday. 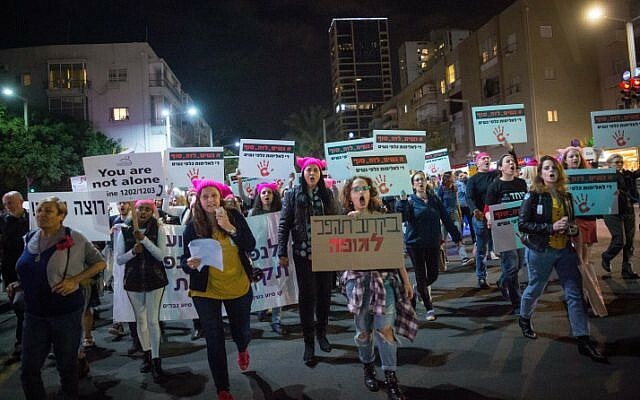 On November 25, hundreds of demonstrators in Tel Aviv decried violence against women and sexism, joining thousands around the world marking the International Day for the Elimination of Violence against Women. 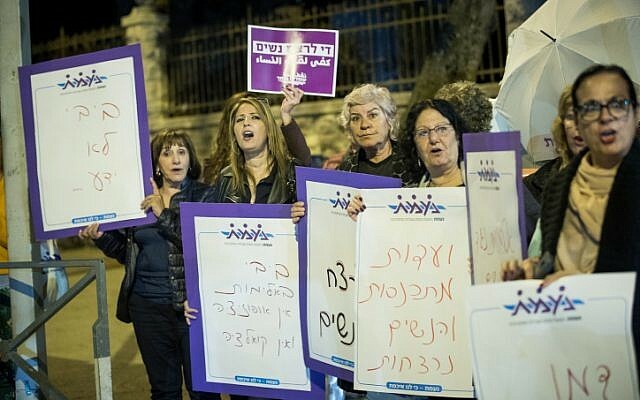 The demonstrators, including MKs Merav Michaeli, Tamar Zandberg, and Tzipi Livni, denounced misogyny and called for government action to halt the murder and abuse of women in Israel. A day later, 16-year-old Yara Ayoub was found dead in her Galilee hometown of Jish, six days after she went missing, according to police. Authorities have identified the primary suspect in the murder as a 28-year-old man from the village, and have arrested several others suspected of involvement. 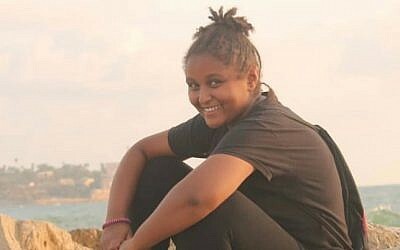 Hours later, authorities said Sylvana Tsegai, 13, was found after being raped and murdered in her Tel Aviv home, allegedly by her mother’s former partner Tesfebarhan Tesfasion, who evaded police for several days before being caught. Sylvana Tsegai, who was found dead in Tel Aviv on November 26, 2018. According to reports, Tsegai had been known to welfare authorities as a victim of domestic violence. She reportedly called police on Saturday to complain about Tesfasion being in her home. At a visit to a women’s shelter on November 25, Prime Minister Benjamin Netanyahu and his wife, Sara, said they were “unsettled” by domestic violence. Netanyahu later told ministers he was surprised to learn that “almost nothing” was done to domestic abusers. Netanyahu said the uptick in violence against women in Israel in recent years was “a criminal phenomenon” and called for stricter enforcement. Netanyahu said he had voted against the Knesset proposal to establish a parliamentary commission of inquiry on violence against women because it was presented by opposition lawmakers. The opposition floated last week’s proposal for a commission of inquiry into violence against women after the government failed to deliver a plan to address the problem, as it had promised to do several weeks ago.